Dian Xiao Er has about 9 branches located through out all parts of Singapore Major Shopping Mall. From the name "Dian Xiao Er - 店小二", you will know that this is a Traditional Chinese Food restaurants that serves Asian delights. Today, we will share with you two of their signature dish at one of their branch at Ang Mo Kio Hub. When you ask around about this place, most of the customers will relate the restaurant as an ancient China teahouse. This is because almost all their furniture and layout are made of wood. As you can see, they even have their own unique menu book that look like those "Secret Manual Menu". 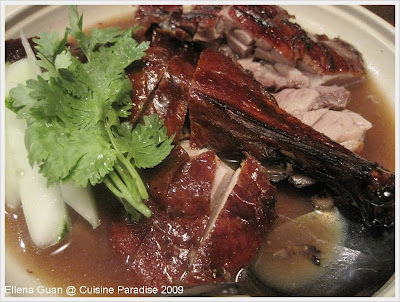 From the list of items in the menu, we select this Dang Gui Roasted Duck, the flavour of the herbs is pleasant and not overpowering for those who don't take Chinese herbs. According to their write-up, duck meat has a nutritional that surprises most people. Lean Duck has 25% more protein than other poultry, high in vitamin B and Vitamin E. Mum was surprised to find the gravy in this dish as she comments that the gravy will actually soften the crispness of the roast duck skin. But after all, if you order rice and other side dishes, this herbal gravy goes well with rice. 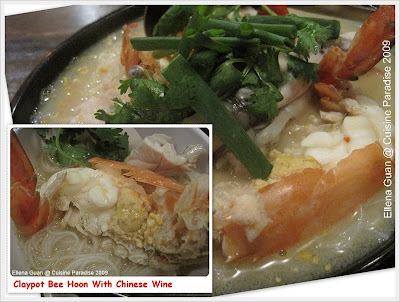 Actually my aim was to try out their new dish "Claypot Bee Hoon With Chinese Wine". I was attracted by the advertisement and write-up shown outside the restaurant as so compare to the usual Vermicelli Crab/Been Hoon Crab, this dish actually use Frog legs and River King Prawns to enhance the sweetness and flavour of this dish. According to the description, they also add in some top grade rice wine to obtain a flavourful golden broth. Overall, the flavour of the broth was great as you can taste the light and fragrant sweetness from the prawn and rice wine. I have heard some pros and cons review on this Beancurd stall which is located at 2 Short Street that is somewhere near Peace Centre, along Selegie Road. I guess those of you who frequent that area might have patronize this stall before. 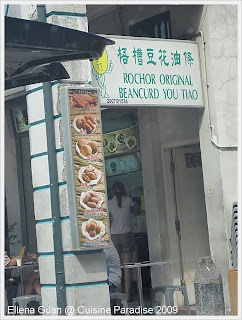 Rochor Original Beancurd - 梧槽豆花油条 owns a two storey shophouse stall near the junction of Short Street and Selegie Road. Due to crowds sometime you might need to sit at the back alleys of shophouses to eat. 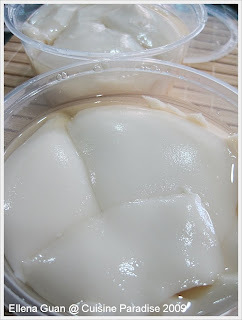 Although their beancurd is silky smooth and yummy with no other artificial taste, but we do find it taste rather sweeter compare to it used to be. So maybe for those who with sweet tooth, this will suits their tastebubs better. 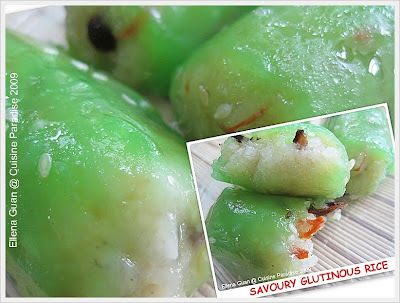 Other than the Red Bean Dumpling, I also grab a box of this Savoury Glutinous Rice sticks. I love the jade green colour of this snack which make it look so appetizing. 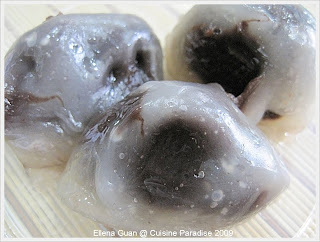 To us this snack taste sort of like the traditional "Teochew Pink(Png) Kueh - 饭桃 ". 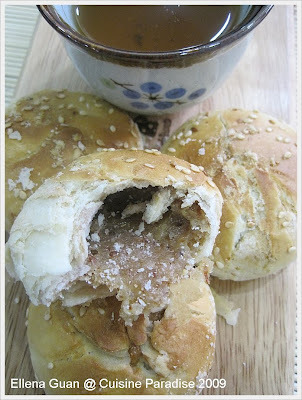 Here is another post relating to Tau Sar Piah........ This is one of our family favourite Tau Sar Piah stall which is recommended by my lady boss. This shop is located at 86 Telok Ayer Street which is some where near the Central Business District (CBD) region. On the other hand, Tan Hock Seng Cake Shop is very famous and has been around for more than 50 years and most of their customers love the "Ma Ti Su - 马蹄酥" and "Tau Sar Piah - 豆沙饼". On and off when we pass-by this shop on the way back after meeting with clients, we will always make an effort to stop by and grabbed a few packet each of their signature pastries. And out of all their pastries, these are the 3 types that I will always grab when I patronize their stall. 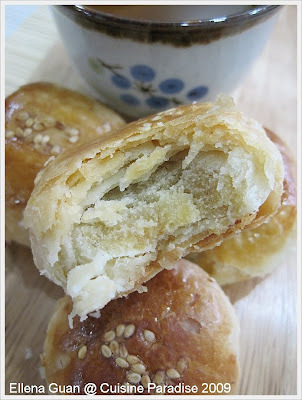 In order to make a different between the Sweet and Savoury Tau Sar Piah, they actually add some white sesame seeds on top of the "Sweet Tau Sar Piah" in order to show the differences. Look at the crispy flaky skin of this little treasure that is filled with generous amount of green bean filling. It has always being our favourite tea-time snacks to be served with a cup of Chinese or English Tea. 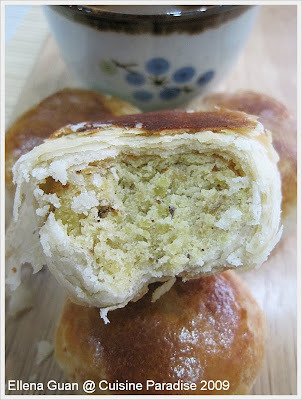 Out of the three flavour that I used to purchase, I was always fascinated by their "Savoury Tau Sar Piah". I love the fragrance of the filling which consists a light scent of onion taste that makes the filling so tasty. 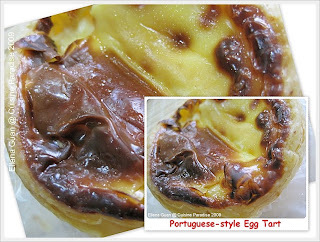 When you start eating it, you can't seems to stop because the crisp skin goes so well with the savoury filling. Em... maybe to some of you, it taste sort of like the "Penang Tau Sar Peng" from Malaysia. Lastly, let's look at the main attraction of this shop which is their Signature "Ma Ti Su - 马蹄酥". During lunchtime, you can always see the lrowds queuing to buy these crisp and chewy biscuits. According to the shop owner, this is so popular that each customer is only allowed to buy 3 packets each. The outer skin of this biscuit is indeed very crispy, fragrant and the filling is chewy and yet won't stick so much to your teeth. And this is one of my boy's favourite which he will always asked me to buy if I am around that area. 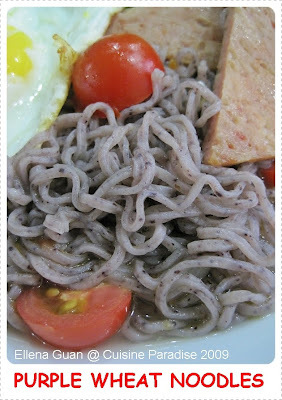 This is a continuation exploring on the new "Purple Wheat Noodles" which I have bought yesterday. After sharing with you the "dry" version on making the colourful Noodles Salad(recipe here) with this "new product". So today I decided to use it to make a Hong Kong Style Soup Noodles with luncheon meat (spam), vegetable and a sunny-side up egg. 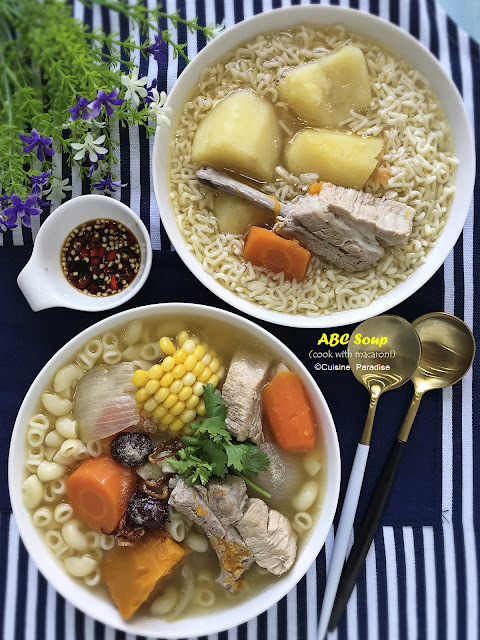 This is a very simple and easy way to prepared Instant Noodles in a more nutritious and at the same time you can present it similar to restaurant style. All you need are some simple ingredients which you might be able to find from your kitchen fridge and pantry. 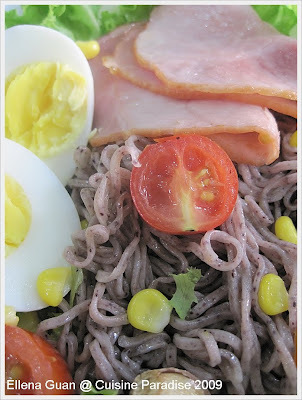 Look at the texture and colour of this "Purple Wheat Noodles" isn't it look great for any combination. The noodles itself taste great with a spongy texture if you don't over-cooked it. 2. Prepared the egg according to your preference, then pan-fry the Luncheon Meat/Spam for 1 or 2 minutes on each side. 3. Prepare another pot of water, add in stock cubes or use instant stock. 4. Bring to boil, blanched the vegetable in it for a few second, remove and set aside. 5. Arrange the noodles in a bowl or soup plate, scoop in some soup base, top with vegetables, Luncheon, Egg and serve immediately. 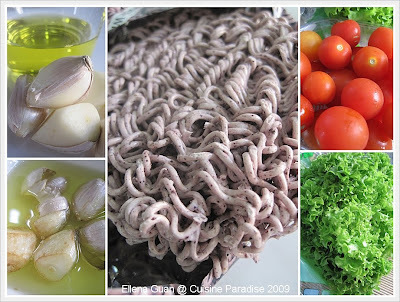 ~ You can swap with any other ingredients that you prefer instead of Luncheon meat or egg. I was attracted to an advertisement on Friday, 23 Oct 2009 in the TODAY newspaper introducing on this new Purple Wheat Noodles from KOKA. I was immediately captured by the word "PURPLE WHEAT" and I am also curious about the actual colour and texture of the noodles. 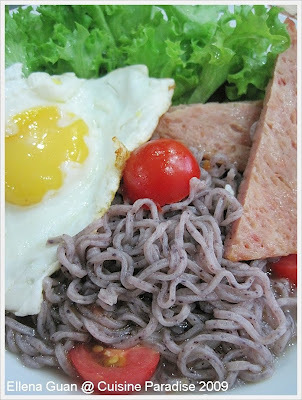 According to the advertisement, the purple colour from the noodles comes from its ingredients which is the "Purpleberry flour" that is the combination of purple wheat and purple corn. And it also stated that this Purple Wheat Noodles is naturally rich in Anthocyanins which is the same antioxidants as those found in blueberries and bilberries. Most imporant of all, they are are "High In Antioxidant - 高抗氧", "Fat Free - 无脂肪" and "Non-Fried - 非油炸". As we have late and heavy Lunch today, I decided to whip up something light, simple but vibrant in colour. So this is what we have for our Special weekend Dinner Menu. With my "new ingredient" that I managed to grab from one of the Supermarket, I can't wait to try out this "new products" from KOKA Noodles. 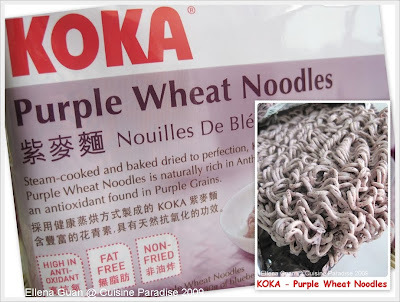 I was attracted to an advertisement on Friday, 23 Oct 2009 in the TODAY newspaper introducing on this new Purple Wheat Noodles from KOKA. I was immediately captured by the word "PURPLE WHEAT" and I am also curious about the actual colour and texture of the noodles. According to the advertisement, the promotion will last for a week which you can read more at this link HERE. After grabbing a packet of this Purple Wheat Noodles which is 1 of the 3 packets left on the shelf. Rey and I starts to look around for other ingredients to prepare our Dinner. 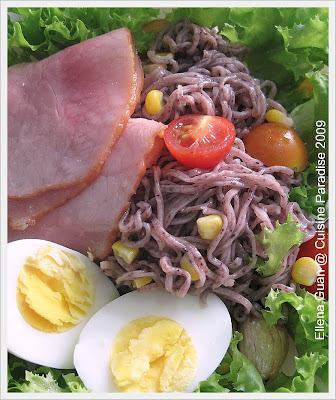 Since this noodle is purplish in colour, I decided to use it to make a Colourful Salad Noodles Dish. Rey suggests to grab a pack of cherry tomato and breakfast ham while I think some curl lettuce will do a great job to enhance the colour and add extra crunch. Other than the salad ingredients, I also made some garlic oil to act as the salad dressing. 1. Preheat a small saucepan with drizzle of olive oil, then add in the garlic cloves and saute it till fragrant. 2. Pour in the remaining olive oil and saute the garlic till slight golden brown, dish up and set aside for later use. 1. Cook the eggs in a small saucepan under medium-low heat for about 4 - 6 minutes from the time the water boiled. 2. Removed from heat, rinse and peel off the shell then cut into halves and set aside. 4. You can either blanched the Ham with boiling water or you can pan-fry it under low heat for about 30 second on each side with some Olive oil. 5. Next, drizzle 1 to 2 tablespoons of the garlic oil on the cooked noodles, toss it well with the blanched corn kernel and cut tomato. 6. To assemble the dish, place some lettuce on the plate, place the noodles mixture on it. 7. Top with ham, hard-boiled egg and you can drizzle some extra garlic oil and serve it warm. So after seeing this Noodles Salad, do you have the urge to try making some for yourself? This is indeed a very healthy and nutritious dish, if you can't find any Purple Wheat Noodles, don't worry, you can always replaced it with whatever you have in your pantry. Singapore Shopping Center has being located in Sembawang Road area among the Semi-detached estate for more than 10 years. I still remember vividly that I used to go there with my secondary school mate to enjoy the BBQ stingray, pizza hut pizza and the famous Thai Food stall. But today, after the 2nd major renovation, Singapore Shopping Center has changed most of its' previous shop/restaurant. 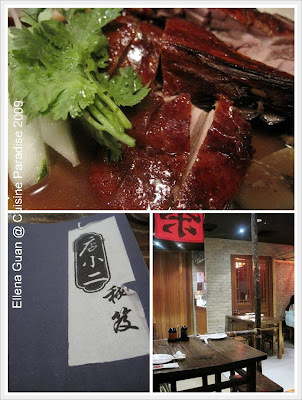 Today we are going to try this Chinese cuisine restaurant located at the second floor known as "Prosperous Kitchen - 天旺". They have mainly two restaurants in Singapore which another branch located at West Coast Plaza. To start off, we order a bowl of their "Brazil Mushroom Chicken Soup" which served in small individual box @ S$5.00 each bowl. The taste of the soup is light, non-greasy and most important is full of flavour that is infused from the Brazil Mushroom. Next we have "Yang Chow Fried Rice", the rice is very fragrant and each grain is nicely fried and separated from each other. Although the price is slightly higher than normal "Zhi Char - 煮炒" stall, I guess it's still worth the price for the taste and its generous ingredients. 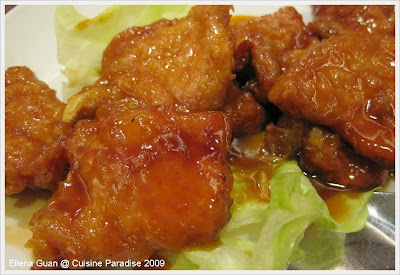 Em... honestly, we are very shock and a kind of disappointed with this "Sweet and Sour Pork Ribs - 京都排骨". First of all, we waited for about 20 minutes due to the dinner crowds, secondly when this dish arrived we thought the waitress might have bring the wrong dish as this look more like "Pai Gu Wang - 排骨王" to us rather than the one we saw and ordered from the menu. The one we ordered, is sort of like pork ribs, darker in colour for the sauce and there are also some extra almond/sesame seeds with it. So compare this to the one we saw it's really a big different. From the myth, they used to say that the main ingredients to make this "3 Cups Chicken - 三杯鸡" is 1 cup each of Dark Soy Sauce, Sesame Oil and Rice Wine. This is rather a traditional Taiwanese dish but you can easily find this in most Chinese restaurants or Zhi Char stall in Singapore. While looking around the tables, it seems that about 6/10 tables around us ordered this dish. 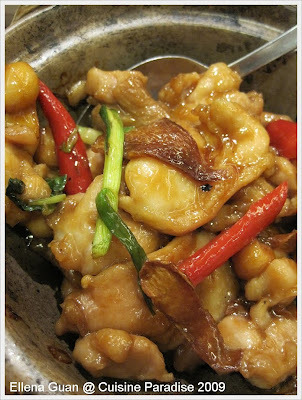 It is serve in a small claypot and you can smell the nice sesame oil aroma when the dish arrived at the table. Overall we find this is the best dish to recommend out of all we have ordered. The combination of the chicken, sauce and side ingredients like chilli, spring onion and etc plays a great part for this dish. Next we have this "Scramble Egg & Prawns Hor Fun - 鲜虾滑蛋河粉" which comes with a serving of about 6 - 8 medium size prawns cooked in scramble egg sauce together with straw mushroom and thin flat rice noodles. This is a one person serving portion which cost S$7.50. 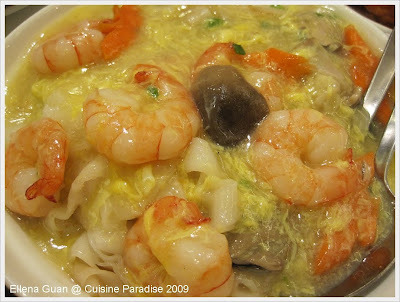 I guess for prawn and rice noodles loves, this is sure a great deal to order. I personally love the combination of the egg sauce with the fried rice noodles. 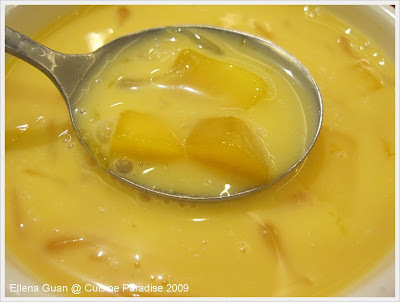 Lastly comes our dessert of the day which is my favourite, "Mango Pomelo Cream - 杨枝甘露". This is kind of different from the usual mango pomelo with shaved ice. As you can see from the photo, this is sort of like a blended mango juice that is mixed with some cream/milk then served with some extra mango cubes and pomelo. Not a good choice you are looking for that kind of Hong Kong style Mango Pomelo with sago. ~ Except Beverages, Desserts, Dim Sum delicacies and Set Menu. 50% off is only applicable from 6pm to closing from Mondays to Fridays, not applicable on weekend and Eve of Public Holidays and Public Holidays. "Jin Long Seafood Restaurant - 金隆海鲜菜馆" is always crowded and reservation is definitely necessary or else you will have to wait for a very long time before you can get a place or till the food to be served. From the waitress, we heard that the stall is going to shift over to the opposite block whereby they will have their own air-conditioning restaurant in a couple of weeks time. 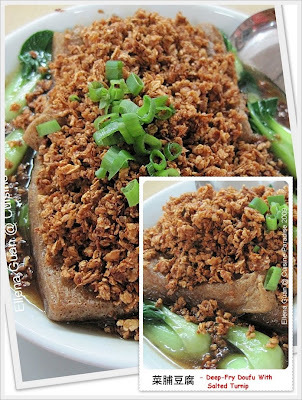 When it comes to Tofu Dish, making a choice to order this "Jin Long's Signature Chai Poh Tofu - 菜脯豆腐" will never disappoint you. The Chai Poh(salted turnip) - 菜脯 topping was so crispy and light that I thought it was minced garlic at a glance of it. The tofu itself is very smooth and silky which you can hardly imagine something after deep-fried can still be so yummy that will melt in your mouth when you eat it. 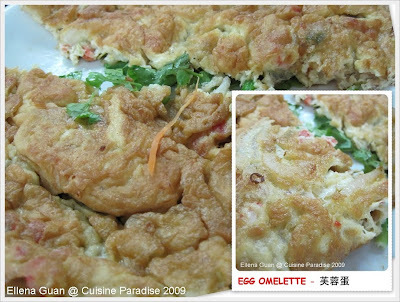 Egg Omelette or "Furong Dan - 芙蓉蛋" is one of the most commonly egg dish that is found in Zhi Char stall - 煮炒摊. A plate of good and tasty Furong Dan depends on the skill of the chef as how he control the fire while frying the egg omelette. The omelette served in Jin Long is just nice with it's slightly crispy outer layer that gives you a very special aroma when eaten. 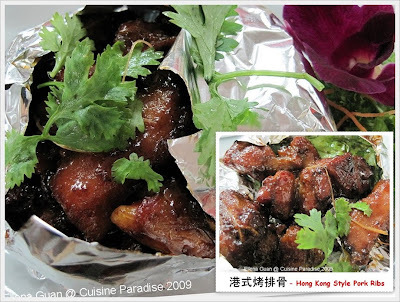 This look similar to one of my favourite dish "Coffee Pork Ribs - 咖啡排骨". But according to the waitress this is known as "Baked Sweet & Sour Pork Ribs - 港式烤排骨". The pork ribs are marinated with their special sauce then baked it until soft and tender. To us the taste of the pork ribs is good but the meat seems to be a little tough for older folks to chew it. Lastly comes the "Deep-fried Scallop Combination - 千叶带子" which is also one of their signature dish where you can enjoy a few taste and texture in one dish. The ingredients that found in this dish are: scallops(you can see from the photo, the scallop used are of thick flesh), prawns, banana and bak kwa. 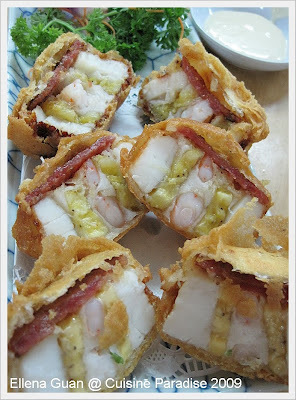 Each layer of the scallop is sandwich with fresh prawn and banana that topped with a piece of bak kwa and deep-fried with their special batter. We have waited for at least 30 minutes for this dish to be served until we almost cancel this order, but luckily the end products was still worth the waiting time. Do give this a try, it's definitely worth the price of less than S$20.00. Since this is the Deepavali week holiday and last week I have being invited for a Curry Sampling at CURRY ON! I think maybe I can share a simple and healthy Curry Recipe with everyone here. So what come in your mind when you read the heading of the post and see the photo. LONGAN + PINEAPPLE + CURRY ? ? ? ? ? ? = NICE? 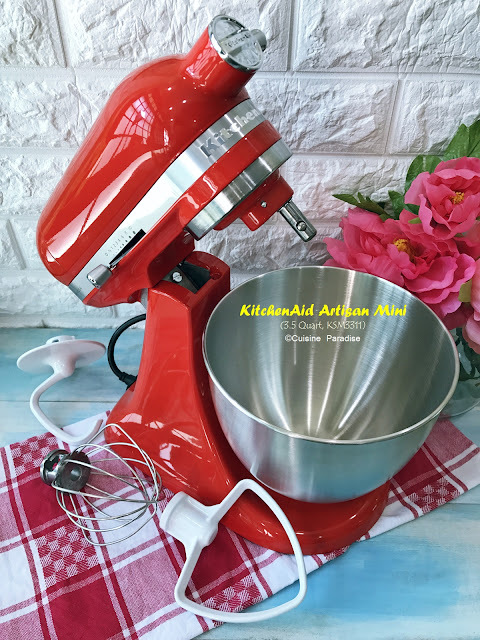 From the ingredients here, you can see that it doesn't required any coconut milk or cream. All you need to get is these simple and healthy stuff which can satisfy your taste buds on curry and also help you to watch your waistline. The main ingredient that provide the fragrance is the Kaffir Lime Leaves which makes give this dish a very refreshing taste and fragrant. I have use this leaf to cook another Chicken Dish a few years back. You can click on this link for more details. 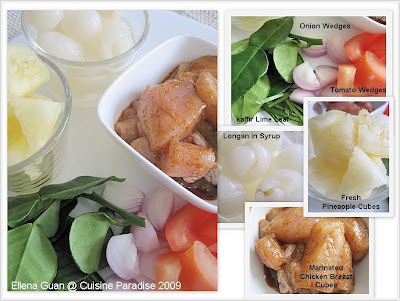 The Longan used in this recipe is from can which contain syrup, you can easily grab a can of this Longan in syrup in any supermarket or convenient store. 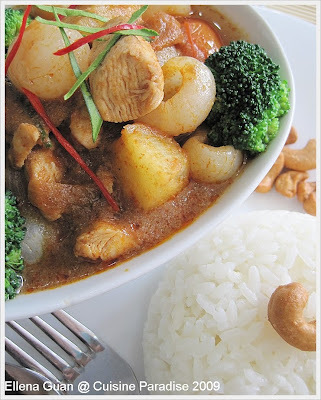 You will be surprised with the taste of this dish, it is something like a cross taste between Sambal and Tom Yum Chicken. It is very easy to prepared without much hassle. 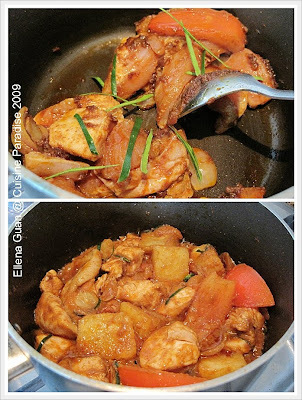 All you need is to cut the chicken breast meat into cubes, marinate with instant curry paste. Furthermore you can even use canned pineapple to replace the fresh type. 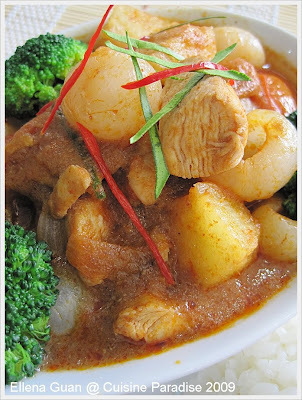 Overall, this is a very refreshing dish because the gravy is infuse with Kaffir Lime leave aroma and Longan. 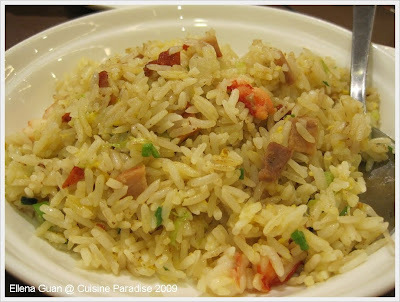 It is an very appetising dish that goes well with steam rice. 1. Clean and trim the fat from the chicken breast, cut it into about 2" cubes. 2. Marinate the chicken with about 1 teaspoon of Thai red chilli paste and 1/2 teaspoon of light soy sauce for about 10 minutes. 3. Heat up a small saucepan with olive oil, saute the onion till fragrant. 4. Next add in half of the tomato wedges and some shredded kaffir lime leave then continue to stir-fry for another 15 second or so. 5. Spoon in the remaining chilli paste and continue to saute until fragrance then add in the marinated chicken cubes and fry till the meat is cooked through. 6. Next add in the pineapple cubes, longan, remaining tomato wedges and give it a good stir till combined. 7. 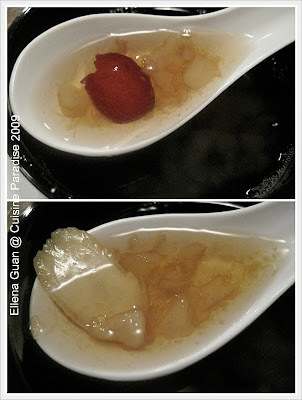 Lastly stir in 2 tablespoons of syrup juice from the longan can and bring the mixture to boil for about 10 seconds. 8. Dish up and served with some balanced broccoli and steam rice. 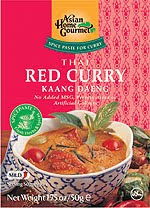 ~ You can get those instant Thai Red Chilli Paste by "Asian Home Gourmet" in most supermarket.